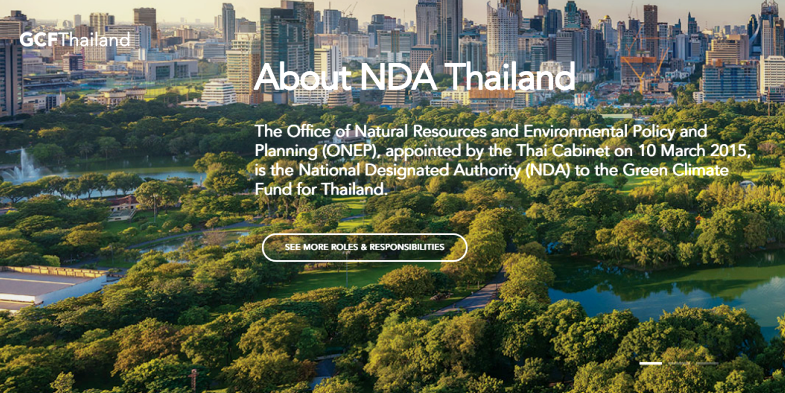 The Green Climate Fund Thailand website provides essential information on the Green Climate Fund, as well as on the Office of Natural Resources and Environmental Policy and Planning (ONEP), which is Thailand’s National Designated Authority (NDA). Projects and programmes in both the public and private sectors who wish to receive financial support can benefit from information on how to access the fund as well as the approval process. This informative website also gives information on Thailand’s national priorities, support areas and measures in the field of climate change mitigation and adaptation, criteria and procedures for proposal review and other related information. Thailand’s GCF projects and programmes, including the GCF Readiness and Preparatory Support Programme, concept notes, funding proposals, latest news and events are also featured. The proposal template, Thailand’s GCF Handbook, Thailand Country Programme, and No-Objection Criteria are available in both Thai and English for download. The website is developed by ONEP in cooperation with GIZ Thailand’s GCF Readiness and Preparatory Support Programme. The Green Climate Fund is the financial mechanism of the United Nations Framework Convention on Climate Change. It aims to allocate equal amounts of funding for projects on mitigation of climate change effects, and on adaptation to its adverse effects. It also aims to allocate at least half of its resources for adaptation to countries that are vulnerable to the impacts of climate change. Since 2017, GIZ Thailand in cooperation with the Office of Natural Resources and Environmental Policy and Planning (ONEP), as the GCF National Designated Authority (NDA), has been a delivery partner in implementing the “GCF Readiness and Preparatory Support Programme”. Highlights of the Programme include the development of the Thailand Country Programme, No-Objection Procedure, the GCF Handbook, and the GCF Thailand website.